GENEVA (14 April 2016) – UN High Commissioner for Human Rights Zeid Ra’ad Al Hussein on Thursday appealed to Iran to halt executions for drug offences until Parliament debates a new law that would remove the mandatory death penalty for drug crimes. Five men were hanged last weekend, three of them on charges of narcotics trafficking. The other two men were convicted of murder. In at least one of the cases, that of Rashid Kouhi, there were serious concerns about the fairness of the trial and the denial of his right to appeal. Kouhi was sentenced to death in 2012 after he was found in possession of 800 grams of crystal meth. He was executed on Saturday, 9 April in Gilan province in northern Iran. Last year, at least 966 people were executed in Iran – the highest rate in more than two decades – the majority for drug offences. At least four of those executed in 2015 were juveniles. However, in December last year, 70 Members of Parliament presented a bill to amend the existing mandatory death penalty for drug offences. The bill, which was introduced in Parliament in January this year, provides for life imprisonment in such cases. It remains to be seen whether it will be taken forward in the new Parliament. “There have been encouraging signs from within Iran towards reform of the law, from the judiciary, the executive and the legislature and I hope the new parliament will adopt these changes. 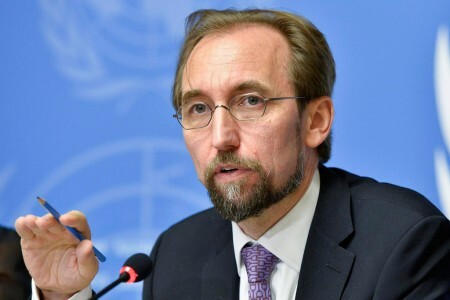 But it is unfortunate that executions for drug-related offences – crimes that clearly do not meet the threshold under international human rights law for application of the death penalty – continue to be carried out in the meantime,” High Commissioner Zeid said. So far this year, 60 executions have reportedly been carried out in Iran. The High Commissioner noted that this represents a drop compared to the same period last year. High Commissioner Zeid also expressed serious concerns about the large number of juvenile offenders reported to be on death row in Iran. He urged the authorities to ensure that no one is executed for offences committed under the age of 18, stressing that there is a strict prohibition against the execution of juvenile offenders in international human rights law, including in the International Covenant on Civil and Political Rights, which Iran ratified in 1975 and the Convention on the Rights of the Child, which it ratified in 1994.